Born: 18 October 1818, Riga, Latvia. Died: 24 November 1895, Cape Town, South Africa. 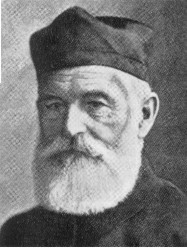 Carl Hugo Hahn joined the Rhenish mission society in 1838 and completed his training as a missionary three years later. After being ordained he was sent out in 1841, accompanied by H. Kleinschmidt, to set up a mission among the Nama under Chief Jonker Afrikaner at present Windhoek. However, because a Wesleyan missionary had also been invited to settle there by Jonker, Hahn decided to work among the Herero instead. After visiting Cape Town in 1843, where he married an English woman, Emma Sarah Hone, he and Kleinschmidt established the first Rhenish mission station in Namibia at Neu Barmen (now Gross Barmen), near Okahandja, where the hot springs provided adequate water. In 1850, after a crushing defeat by the Namas, the Hereros moved away to avoid further attacks and Hahn was recalled to Germany. As the Wesleyan mission among the Nama had been withdrawn because of the fighting, he was next sent to Windhoek as originally planned, but the attempt was unsuccessful and he arrived back in Germany in September 1853. He was sent to the territory again early in 1856, settling at Otjimbingwe (on the Swakop River, south of Karibib), where some of the Hereros had sought refuge. During his long stay among the Herero Hahn made a study of their language and was able to deliver his first sermon in Herero in January 1847. In 1849 he and Reverend J. Rath published a history of the Bible in Herero, with translations of some parts and hymns. He completed a Herero grammar in 1854, which also included a Herero-German dictionary of over 4000 words. This was followed by a number of other religious books in Herero over the next twenty years. From Otjimbingwe Hahn set out with Rath in May 1857 on a journey of exploration into Ovamboland in the hope of extending his mission. Accompanied by the hunter Frederick Green* they reached Ondangwa, north of the Etosha Pan, but were forced back by the hostile attitudes of the local population. The three wrote "Account of an expedition from Damaraland to the Ovampo in search of the River Cunene", which was published in the Proceedings of the Royal Geographical Society (Vol. 2, pp. 350-354) in 1858. Hahn also published a short but well-written travel account, "Reise von Hugo Hahn und Missionar Rath in Suedwest-Afrika", in Pettermann's Mitteilungen in 1859. Years later he wrote a further paper on his travels, "Missionar Hugo Hahn's Reise im Lande der Hereros und Bergdamara in Suedwest-Afrika, 1871", which also appeared in Pettermann's Mitteilungen (1873). This was followed by a description of "Damaraland and the Berg Damaras" in the second series of the Cape Monthly Magazine (1877, Vol. 14, pp. 218-230, 289-297). Several accounts of his work and travels were published also in the Berichte der Rheinischen Missionsgesellschaft between 1850 and 1872.However, a map of Great Namaqualand and Damaraland ascribed to him by Logan (1969) and others was actually compiled by J. Theophilus Hahn*. Hahn was a keen naturalist and collected reptiles and amphibians in the vicinity of the mission stations at Neu Barmen and Otjimbingwe. His specimens were sent to W.C.H. Peters* at the Zoological Museum in Berlin, who described them in 1862, 1867 and 1877, and named 13 new species on the basis of the collection. The protracted war between the Nama and Herero made mission work very difficult and Hahn returned to Germany in June 1859. He travelled extensively in Germany, England and Russia as an itinerant preacher for his society, but early in 1864 returned to Otjimbingwe. He arranged for German artisans and agriculturalists to come out and assist the missionaries, and in 1866 established a training school for Herero youths, but in 1868 the Herero moved back to Okahandja. Two years later Hahn was instrumental in arranging peace between them and the Namas, which lasted to 1880. Differences between him and the church authorities in Germany led him to resign from the society in 1872. He returned to Germany the next year and in 1874 was awarded an honorary doctorate in literature by the University of Leipzig for his philological work. That same year he settled in Cape Town as minister of the German Evangelic Lutheran Church, assisted by his son, C.H. Hahn junior. Following renewed hostilities between the Nama and Herero he was sent to Namibia on behalf of the British government to try and restore peace. In his comprehensive Report on affairs in Damaraland and Great Namaqualand of March 1882 he strongly recommended that Walfish Bay and the surrounding region should remain British territory. Owing to failing health Hahn retired in 1884. The next year he published an early description of Luderitz, "Angra Pequena vor 25 Jahren", in the Mitteilungen der Geographischen Gesellschaft zu Jena. In "Unsere suedafrikanische Kolonien und Schutzgebiete" (Das Ausland, 1887) he presented a realistic assessment of South West Africa for German agricultural colonisation, in contrast with the overly optimistic views of W. Belck*. After a few years in Europe he returned to the Cape in 1887, staying with his second son, Hugo, who was by then minister of the German congregation at Paarl. His pioneering work among the Herero, carried out under difficult circumstances, made him an outstanding figure in the history of the Rhenish mission society. His diaries, covering the years 1837-1860, are kept in the Archive Services Division of the Department of National Education in Windhoek. Dictionary of South African biography, Vol. l, 1968. Google scholar. http://scholar.google.co.za Publications by C.H. Hahn.